- The home of happy purebred dogs! Team Trucker's consists of people with the same kind of attitude, common goals and vision of the future. The main idea of the team is to breed dogs that are healthy both mentally and physically, social and according the race standard. We use the latest health reseach methods to avoid the health problems and all health tests are done before matings. Special attention is being paid to maintaining racial diversity in the long term. At this moment we breed mostly cirneco dell´etnas and poodles only every now and then. It is of utmost importance that all our dogs live normal everyday life as family members and neither they nor their puppies are kept in the cages and separated from people. We want Trucker's puppies to be treated as beloved family members in their future homes, not just an objects. We sell living creatures with their special needs and we expect you to be loving, understanding, fair, patient and dedicated to your new family member. Our puppies cannot be sold to puppy factories, as status symbols or for bad conditions. For that reason, we won´t sell puppies to unknown condititions and we choose the families very carefully. We want to continue hearing news about the puppies in their new homes. We are committed to supporting you and helping you throughout your dog's life, no matter what happens. So if you feel it hard to keep in touch, you are in a wrong site and you should keep on looking for another puppies. We do not ship puppies alone as a cargo and we want to meet the buyer in person. When we do the contract of sale, the buyer must be able to prove his/her identity. 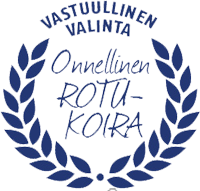 We use always Finnish Kennel Club's forms when we sell or give dogs to placement homes. All our puppies has a veterinary certificate about their health before they are leaving to their new homes, all the puppies are registered, microchipped and DNA parentage verified and they have also MyDogDNA pass.